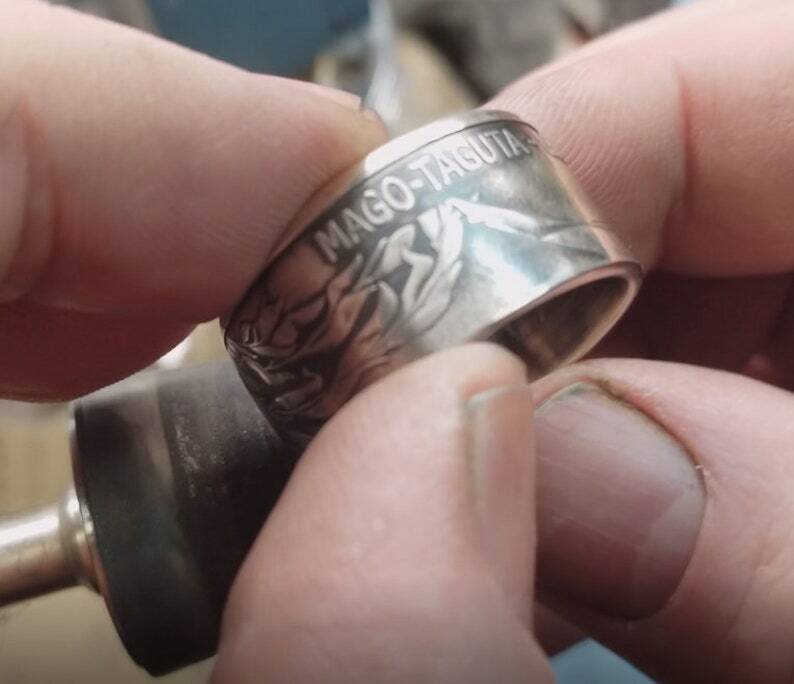 Has your coin ring become aged, lost it's luster, precious metal plating or antique patina? Send it to me and I'll refinish it to look as good as new again. 1. Mail your coin ring to me at the address below. Be sure to include your legal name and full details along with any special requests and if you originally bought the ring from me, kindly provide your ETSY user name as well so I can look up your account. When shipping your ring, be sure to get tracking information and insurance if needed just to avoid any USPS issues with delivery. 2. Purchase this service to restore your ring and select the finish you are requesting to have done. If desired, a jewelers clear coat will be included free of charge which helps prevent antique patina or precious metal from fading or wearing but should be noted that reapplying the clear coat should be done periodically (on average every 4-6 weeks) depending on your use to extend the life of your rings finish. 3. You can request your own personal sized bottle that will last an average of one year to reapply the finish as needed in the options section to the right as well. The only thing better than the Jewelers Clear Coat is a Transparent Hypoallergenic Powder Coating (Hypo-Powder Coating) that puts a hardened shell on your band and comes with a 3 year re-application guarantee. ▶ Shipping charge here is for the return of your ring after it's been refinished. It does not include the cost to ship your ring to me as that needs to be done on your side to the return address shown above. 1968-1982 50 CENTAVOS- MEXICAN Flat Coin Ring (Titanium Closed Band w/ Reeded Bezel) (24K Gold, Natural Silver or Antique Patina Finish). 1968-1982 50 CENTAVOS- MEXICAN Flat Coin Ring (Adjustable Open Band w/ Straight Wall) (24K Gold, Natural Silver or Antique Patina Finish). REG: 149.95 United States Air Force - Heavy Silver Coin Ring (24K Gold, Rose Gold, Natural Silver or Antique Patina Finish).